The basic plan was to make the trip from Marmaris, Turkey to Port Said, Egypt and the start of the Suez Canal in three legs. The first leg would be east along the Turkish coast to Finike, an overnight passage of 115 NM. Finike is a logical departure point for Cyprus and has a full service marina that could deal with any last minute problems. 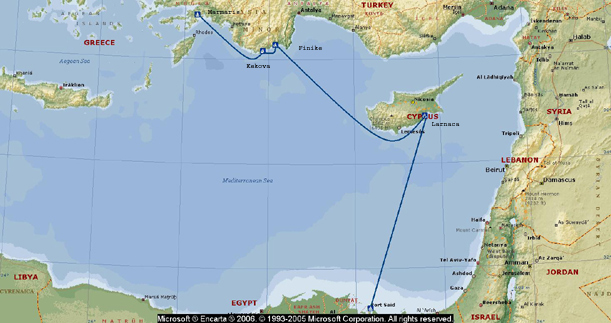 Larnaca, Cyprus is 225 NM from Finike and about midway from Turkey to Egypt. In Cyprus there is no hassle from customs when shipping in parts for vessels in transit. So we arranged for a large number of engines parts to be delivered in Larnaca. Fortunately, most are still their original packing. 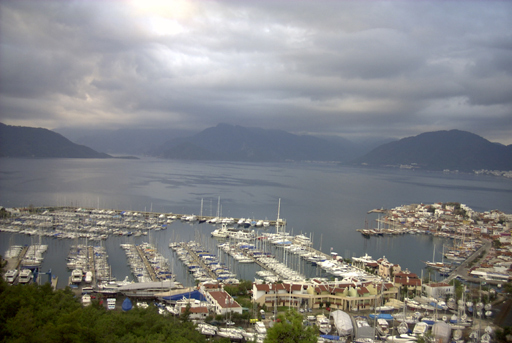 Marmaris bay is one of the world's beautiful harbors and Netsel marina is tucked up in the northeast corner of the bay. The marina is nestled next to the ancient port and old town. Boats moored in the marina are within easy walking distance of the main bizarre and most things of interest to a live-aboard cruiser. This idyllic location was our wintering-over spot for four winters and our base of operations for three cruising seasons. There was just no way we would be able to cast off the lines for the final time without feelings of sadness. These feelings were accompanied by feelings of trepidation; did we make the right decision; is there enough food on board; is this the right time of year for the voyage, did we make the proper obeisance to the right gods, etc. Then there is the feeling of whew! the preparations are finally over. Departures are always bittersweet, until the reality of the cruising sets in. It happened at 01:00 hours, during our first overnight passage to Finike, we ran into a huge floating fishing net. It completely engulfed the boat, wrapped in the screw and stopped the diesel engine dead. Walt spent an hour under the boat cutting the net away from the screw while trying not to become entangled. It was almost daybreak before we were again on our way and we were both exhausted. We made for the closest safe anchorage and rested for a few days before continuing our trip to Finike. Not yet 24 hours out and while not disaster it was not good, what an auspicious start to a voyage of over 6000 miles. We had to wonder which of the Gods we had failed to acknowledge. Entering Port Said is a bit of a tricky business because of the high volume of large cargo vessels and the narrow channel they must navigate. The cargo vessels are convoyed through the canal and vessels not members of a convoy are not permitted in the canal during a convoy's passage. We planned our arrival so the last of the south bound convoy had cleared Port Said and before the north bound ships arrived. On arrival we Med-moored (bow to a buoy and stern to a quay) at the Port Fouad Yacht Club where we spent the next forty-eight hours being buffeted by the wakes of continuous canal traffic. 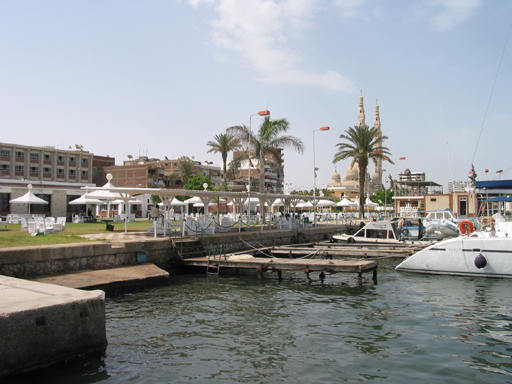 Port Fouad is on the opposite side of the canal from Port Said, with all the activity in preparations for the canal transit we did not have much time to explore Port Fouad, but based on the one foray we did make we felt like we had not missed much. During this time we met with Felix, our canal agent, had our tonnage measured, and paid our canal fees.